Aspirin is a drug that is used as a pain killer (analgesic) and a fever reducer (antipyretic). It also has anti-inflammatory properties. 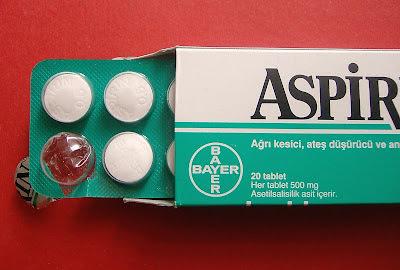 Aspirin is also known as acetylsalicylic acid. It is a salicylate drug that was first isolated by Felix Hoffmann, a chemist with the German company Bayer, under the direction of Arthur Eichengrün. It works by stopping the production of certain natural substances that cause fever, pain, swelling, and blood clots. Nonprescription aspirin is used to reduce fever and to relieve mild to moderate pain from headaches, menstrual periods, arthritis, colds, toothaches, and muscle aches. Nonprescription aspirin is also used to prevent heart attacks in people who have had a heart attack in the past or who have angina (chest pain that occurs when the heart does not get enough oxygen). Daily aspirin usage is associated with lower overall cancer mortality, but the association may be smaller than what was previously believed, according to a study published August 10 in the Journal of the National Cancer Institute. A recent pooled analysis of randomized trials looking at the effects of daily aspirin use as a preventive measure for vascular events found a significant decrease in overall cancer mortality, of 37%, during a 5-year follow-up analysis, and 15% during a ten-year follow-up. Despite this finding, the effects of long-term daily aspirin use on cancer mortality remain largely unknown. In order to determine the effects that long-term daily aspirin use has on overall cancer mortality, Eric J. Jacobs, Ph.D., of the Epidemiology Research Program at the American Cancer Society in Atlanta and colleagues looked at data on 100,139 men and women from the Cancer Prevention Study II Nutrition Cohort who had no prior history of cancer and had been taking a daily dose of aspirin. They used follow-up questionnaires to investigate peoples' aspirin intake. The researchers found that among 5,138 participants who died because of cancer, daily aspirin usage was linked with slightly lower cancer mortality and was unrelated to the length of daily use. "Our results are consistent with an association between recent daily aspirin use and modestly lower cancer mortality," the authors write. However, the estimated reduced risk of 16% was much lower than the 37% reduction seen during the five-year follow-up period in the pooled analysis. Still, the researchers write, "Even a relatively modest benefit with respect to overall cancer mortality could still meaningfully influence the balances of risk and benefits of prophylactic aspirin use." The authors do point out a potential limitation of their study—namely that it was an observational study, not a randomized trial, so they could have either underestimated or overestimated the size of reduction in cancer mortality from aspirin usage because of confounding factors. In an accompanying editorial, John A. Baron, M.D., of the Department of Medicine at the University of North Carolina School of Medicine writes that the findings of the study reinforce the idea that there is a link between daily aspirin use and reduced cancer mortality. "The drug clearly reduces the incidence and mortality from luminal gastrointestinal cancers, and it may similarly affect other cancers," he writes, and noted that the findings from the American Cancer Society study may be "conservative." However, he cautions that, "As for any preventative intervention, the benefits must be balanced against the risks, particularly when the benefits are delayed whereas the risks are not."